Expanded reissue of Tommy Stinson (The Replacements, Guns n’ Roses) and company’s debut! When The Replacements called it quits in 1991, Tommy Stinson missed playing in a band with great chemistry and who all shared the same vision. 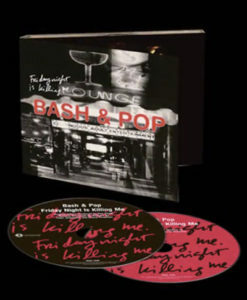 He recruited then Replacements drummer Steve Foley, Foley’s brother Kevin, and Steve Brantseg to form Bash & Pop. Recorded with Producer Don Smith (Cracker, Keith Richards, John Hiatt) and with help from Heartbreakers Benmont Tench and Mike Campbell, Americana icon Greg Leisz, Wire Train’s Jeff Trott, and more, the band’s debut album, Friday Night Is Killing Me, arrived in January of 1993. It combined stellar performances and a renewed energy, something many felt the last few Replacements records were missing. Friday Night Is Killing Me returns on the heels of this year’s new Bash & Pop album and tour. (The band will be heading out with The Psychedelic Furs across the U.S. this Summer/Fall.) In addition to the original 11 track release, an 18 track bonus disc adds rare singles and B-sides, their contribution to the soundtrack of the 1994 film Clerks, and a whopping 15 previously unissued performances. The packaging contains photos and a new essay from Bob Mehr, author of the acclaimed best-seller Trouble Boys: The True Story Of The Replacements. While many are discovering Bash & Pop for the first time on their current tour, and via their new release, the time is right to reintroduce the record that started it all—Friday Night Is Killing Me. A home recording that is a true harbinger. Both a sign-post and a statement of intent from Tommy Stinson in the wake of the Replacements break-up. It heralds the start of his solo career and reeks of defiance and determination. Stream the song and check out the album artwork and tracklist below.